Front supports nesting tags to categorize them in groups and allows you to drag messages from your inbox into a private tag to file them away. When you connect a Gmail or Office 365 account, your Gmail labels and Outlook folders will be synced to Front automatically as tags. To learn more about tags, read Understanding tags. For a shortcut to messages with important tags, pin them to your private workspace. Click the Workspace options icon, and find a private or team tag in the list. Click the pushpin to pin it to your workspace to give you one-click access to conversations with that tag. If you pin a nested tag, you will see the nesting in your workspace. When you pin private tags to your workspace, you can drag messages into them like folders. Filing a message in a private tag does not affect other participants in the conversation, so you can organize your personal workflow the way you want. Pin a private to your workspace following the instructions above. Click and hold to drag a conversation from your Inbox into a pinned private tag. You can only drag conversations into private tags, as you will see team tags grayed out when you drag. The conversation will no longer be visible in your inbox. Find the conversation by clicking on your private tag, which acts as your private folder. Note: Tags will be automatically added or removed from the conversation when you drag a conversation from your inbox into a tag or between tags. The Inbox tag is a default private tag added to every conversation in your private workspace (your private inbox, Shared with me, Assigned to me). That way, you know if a conversation lives in your Inbox or in a private tag that you're using like a folder. If the conversation comes into your private inbox, gets assigned to you, or is shared to you, this tag will be automatically added since all of these are your own copies of the conversation that you can freely work with. The Inbox tag makes possible the ability to move conversations into a private tag to be used as a private folder. Once you drag-and-drop a conversation from your Inbox into a private tag, it will remove the Inbox tag, and add the private tag. You can always re-add the Inbox tag to a conversation if you want it to show up in your Inbox again, or drag-and-drop the conversation from your private tag back into your Inbox. Have been waiting for these feature for long. Sadly only works with private tags, what a waste of time honestly. Andrew Armitage Hi there! 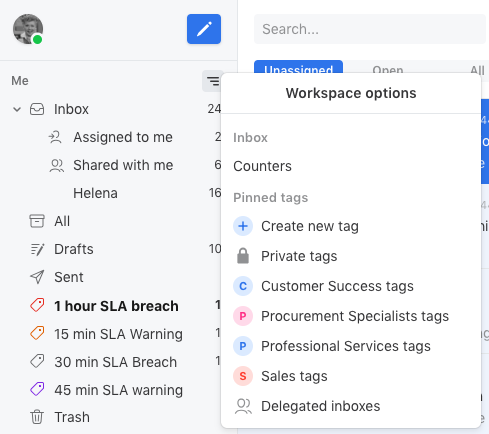 The Inbox tag is added to all the conversations in your private workspace, including Assigned and Shared conversations since those are considered your copies of the shared conversation. The inbox tag allows you to then drag and drop any of your own copies to organize into your private tags (aka folders), as the inbox folder will be removed and new tag will be added to signify that it's been moved out of the inbox. Some users who don't have a private inbox added will also be able to use private tags as private folders in this way. So even if conversations were already archived, you can still retroactively organize things if you'd like, made possible by the Inbox tag. And if you don't use private folders, you can just ignore the tag as it's just silently added. Hi Vitor Luis and Aleksander Palamarczuk - we definitely agree adding drag and drop between team tags would be very helpful, and we are looking into adding it soon! We have always had team folders (empty inboxes) to organize your team conversations, so you can still use that for now. We will let you know once drag and drop for team tags is available! Helena Li I'd love to know who the use case of the nested tags were for. The reason people were excited about them, was for teams to be able to better use tags and to understand more about what customers are talking about. There's no point in doing that for private conversations, because you rarely (if at all) need to report on them. Zendesk's 'tag categories' is essentially what you want to compete with here, and I'm quite baffled why it hasn't been introduced from the get-go. Nesting: You can set up parent-child relationships for both private and team tags. This should make it easier to organize and use both kinds of tags. Drag-and-drop: You can use private tags like folders for any conversation in your inbox (even team conversations). 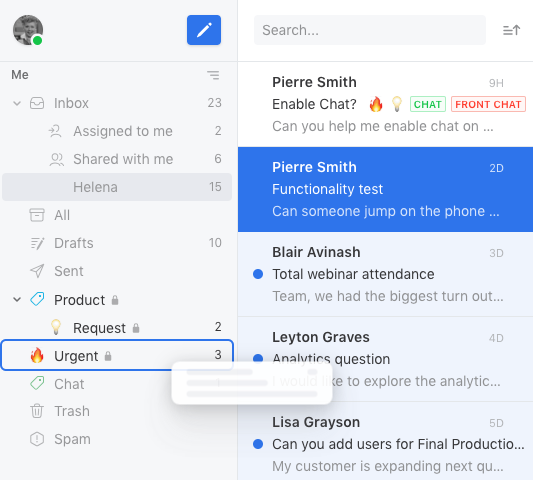 This is to give people more control over how they organize their inbox, especially if they are transitioning from Outlook or Gmail and use folders and labels heavily there. Let me know if that helps, or if I misunderstood your question! Helena Li P.S. I'll delete my original comment so no one is confused by it. Helena Li I can't delete comments. Oh well.